The department is a professional, full service organization providing comprehensive law enforcement and security services to all components of Hampton University and services unique to an academic institution. 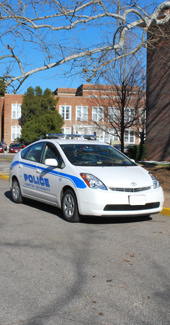 Hampton University Police provides around the clock services 7 days a week, 365 days a year. The department has 43 authorized positions, including 25 state certified police officers, 10 security officers, 5 telecommunication personnel, and various administrative support personnel. The state certified police officers have full arrest powers, and receive their training from the Hampton Roads Regional Academy of Criminal Justice. The University Police Department cooperates with local, state, and federal agencies to investigate criminal activities, and to coordinate special events and task force initiatives. We encourage faculty, staff and students to notify the department if suspicious activity is seen or suspected. Providing courteous and efficient service to the entire Hampton University community, is essential to our goal of maintaining a safe campus. The Hampton University Police is dedicated to providing professional law enforcement services to the Hampton University community. Acting as an important arm of the educational process of the University, we will be proactive in crime prevention and responsive to those issues that impact the safety and security of all students, faculty, and staff.